Chronic bad breath or halitosis, is not just a problem in the mouth. It is a deeper problem coming from the gastrointestinal tract and the sluggishness of the detoxifying organs. Bad breath, or the medical term, halitosis, is used to describe unpleasant odors coming from a person’s mouth when they exhale with their mouth, or when they open their mouth to speak. There is the transient bad breath which is a common and temporary condition that everybody experience at one time or another. This condition is normally caused by thirst, hunger, poor oral hygiene, smoking, stress, and eating certain kinds of food like onion and garlic. “Morning breath” is a good example of transient bad breath. These often can be easily corrected by chewing a gum or brushing teeth. Chronic bad breath is a more serious condition occurring in one out of four persons. The affected sufferers who are aware of their condition may suffer low self-esteem and would try many methods to reduce their bad breath. The methods may usually work but only for temporary. If you suffer from chronic bad breath, seek medical help to check the root cause. Sometimes, prolonged medication may be the cause of your chronic bad breath. Remember, bad breath is usually a symptom of poor underlying health condition. Chronic halitosis may be a symptom of indigestion, constipation, dental decay, gum disease, or other more serious conditions like poor gastrointestinal health, diabetes, sinusitis, tonsillitis, kidney disease and liver problems. More often than not, you may not know that you have bad breath. To check if you have bad breath (try this in the privacy of the bathroom), lick the back of your palm, let it dry in a minute and smell it. Sufferers of very bad breath may have a bad taste in their mouth that is sour or metallic. When there is bad breath, the tongue most likely is covered with a thick coat of white matter that are made up of food debris, dead cells and a multitude of dead and living bacteria. Look into the mirror when you wake up in the morning before you brush your teeth and you will see this white matter that gives out the foul smell. This is why it is important that you brush your tongue in the morning. Or use an inverted spoon to scrape away the foul-smelling bacteria. There are several hundreds of bacteria in an average mouth. These bacteria are naturally occurring, and flourish in the back of the tongue in the absence of normal mouth activities like eating, drinking, or sucking on a mint. The type of bad breath which I want to address here is the chronic bad breath caused by poor gastrointestinal health or a diseased liver, which are common. Causes of liver problems are diverse, but mostly because we have overtaxed our liver with too much fat, alcohol, sugar, drugs and chemicals from processed foods. The liver is not able to remove toxins as fast as we load our body with foreign and harmful consumption. Toxins include metals like aluminum, arsenic, nickel, mercury that somehow found their way into our bodies through contamination in our food and water. If the cause of your halitosis is from other diseases, following a healthy juicing diet will also help much; not only in eliminating bad breath, but also in correcting the underlying cause that is manifest in bad breath. 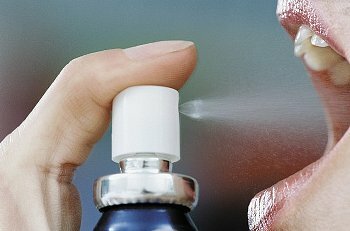 If you’re using mouthwash or breath freshener, ensure that they don’t contain alcohol. There are a few popular brands in the market that use alcohol as an ingredient. Alcohol causes the “burning sensation” and dry mouth that also kills the healthy cells, leading to gum and mouth diseases. More often than not, bad breath comes from a poor gastrointestinal health, the “piping system” that begins from your mouth into your throat and down into the gastrointestines. This is common in cases of poor eating habits where very little fibrous foods are eaten. We need to clean out the intestinal tract. One way is to go on a colon cleanse in the form of a fiber drink program. Another way is to go on a juice fast/feast that helps to clean out the intestines. Short fasts don’t help in this case, you’ll need to go on an extended fasts of over 21 days where healing begin to take place. First and foremost, avoid alcohol, caffeine, processed foods, sugar and animal fats (lard). Go on a detoxification diet by drinking plenty of fruits and vegetable juices, especially vegetable juices as they are highly effective in cleansing and removing toxins to be eliminated from the body. During this cleansing journey, you will encounter some healing reactions. If you had hives before, hives will break out again during this detox period. If you had headache, it will recur, probably at a higher degree, and so on. Do not be afraid, this is proof that your body is responding to your healthier diet. Fasting allows the body to rest while it channels its “energy” to cleanse out the body. 1 teaspoon of raw honey + 1 teaspoon of Braggs’ apple cider vinegar + a glass of 250 ml room temperature water + good quality psyllium husk powder. Drink 2-3 glasses of green juices daily and at least 2-3 liter water. If you encounter bloating or a low-grade fever, it is a healing reaction. Reduce the number of times that you drink the psyllium husk drink and drink more water instead. Here’s another colon-cleansing mixture that works too. You may choose to use either mixture to achieve the same result. During the cleanse, it is also important that you take a course of high quality probiotics. Here are some recommended probiotics supplements that are effective. A proper gastrointestinal (GI) cleansing program will help to clean out not only the colon, but the entire digestive tract that is about 21 feet long. Once your digestive tract is cleansed out, absorption of nutrients is optimized. With a clean digestive tract, healing takes place more rapidly as you continue to drink healthy fresh juices. Of all the GI cleansing products in the market, I find Dr Natura’s colonix range to be very gentle, safe and effective to do. For best results, you may want to get the entire range, although a bit pricey, they work if you follow through. Regularly drinking carrot, green apples and spinach/kale juice helps to improve colon health over time. This combo gradually helps cleanse the gastrointestinal system. But do not limit yourself to only these foods on the list. 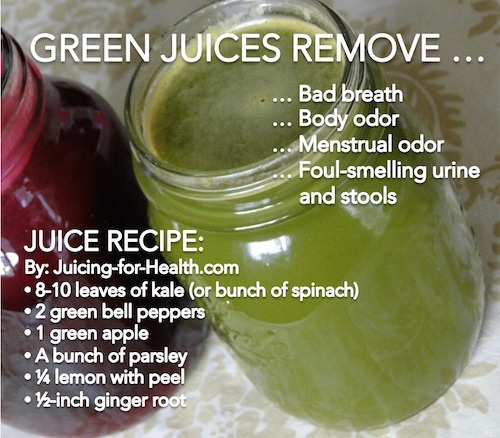 Do add more greens in your juices as they’re all very detoxifying. When doing a colon cleanse, it is important to take lots of vitamin C or high antioxidant drinks. The citrus fruits are some of the best sources of natural bioflavonoid and vitamin C, the two most essential anti-septic agents that help reduce toxicity during a cleanse. Begin to add these “natural probiotic foods” in your daily diet: jicama, lotusroot, rutabaga, radish, celeriac, cilantro, fennel, garlic, ginger, leeks, lemongrass, onion, parsley, turmeric. They help to repopulate the beneficial bacteria that will help with digestion and overall health. Eat them fresh or add them into your drinks or foods. Most people don’t like the smell/taste/flavor/odor of these foods, but neither do the harmful microbes—they cannot live in/with this environment. On the other hand, the beneficial bacteria (which we want) love these foods, thrive in them and begin to multiply when they have these foods. Drink LOTS of water! Learn how to make great tasting green juices.